Dry-Treat Stain proof impregnating sealers permanent protection of marble natural stone, tiles, benchtop, vanity, paving, concrete and grout. Premium protection from staining, salt efflorescence, water damage, freeze thaw damage and graffiti. 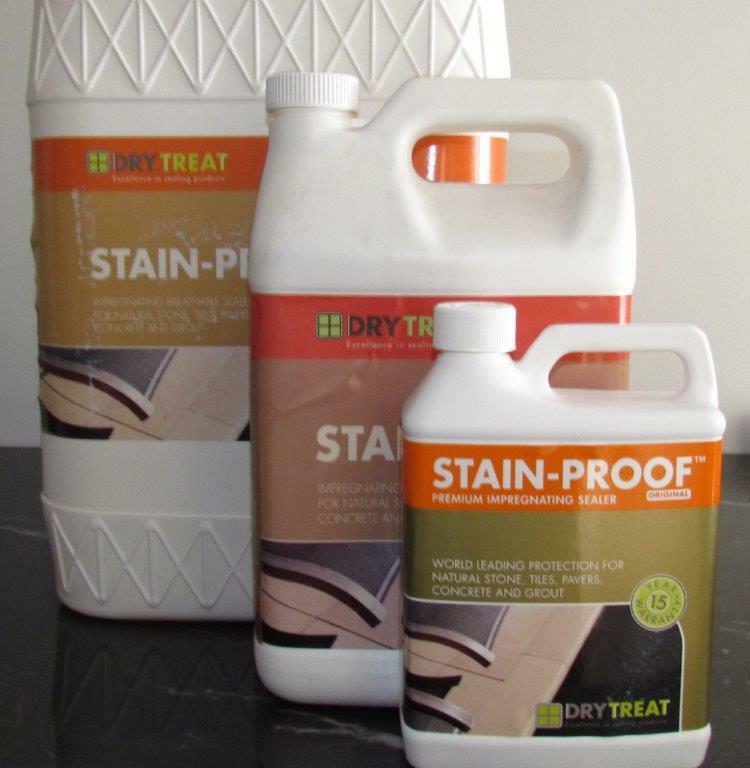 Dry Treat STAIN-PROOF Original™ is an impregnating, invisible and breathable sealer that protects natural stone, tiles, pavers, concrete and grout from damage caused by water, salts and oil-based stains. Treated indoor and outdoor surfaces become easier to clean, maintain, and keep looking good for longer. ry Treat Stain proof is able to greatly reduce water uptake and minimize moss growth, freeze thaw spalling and efflorescence; an excellent chloride ion salt screen - ideal for marine and pool areas; highly water vapor permeable, able to breathe so there is no build-up of subsurface moisture, allowing it to dry out; deeply penetrating; very alkali resistant; won't break down in contact with cement based materials, able to seal hairline cracks up to 0.3 mm (0.012 in.) and does not flake or peel. Warranty: A 15-YEAR PERFORMANCE WARRANTY is offered when product applied by an Accredited Applicator following our written instructions and surface is maintained regularly using our written maintenance system, as outlined in our warranty document. Spills should still be cleaned up immediately to minimize absorption. Application rates: Total application rate is approximately one liter per two to 25 sq. meters (20 to 250 sq. feet per quart) depending on absorption. 1. TESTING STAIN-PROOF™. STAIN-PROOF™ must be allowed to cure for at least 3 weeks before undertaking testing. 3. APPLYING STAIN-PROOF™ ON HIGHLY POROUS SURFACES. Even once impregnated, natural stone still needs to be correctly cared for. Dry-Treat has created a new care treatment sheet, a simple guide to caring for natural stone which can be printed off and given to customers. Precautions: Do not take internally. Apply when surface temperature is between 5 - 35ºC (40 - 95ºF). Avoid moisture contact with the surface for six hours after application. Protect surrounding areas from over-spray. Keep away from drains, plants, water and soil. Use only in well-ventilated areas. Use a positive pressure respirator if ventilation is inadequate. Wear suitable, solvent-resistant gloves, protective clothing, safety goggles and an organic vapor respirator during application. Avoid applying in windy conditions. Wash hands thoroughly. Active content: 50 per cent active content in alcohol. Pack size: One Quart (946 mL), 1 Gallon (3.79 L), 5 Gallons (18.9 L) containers.